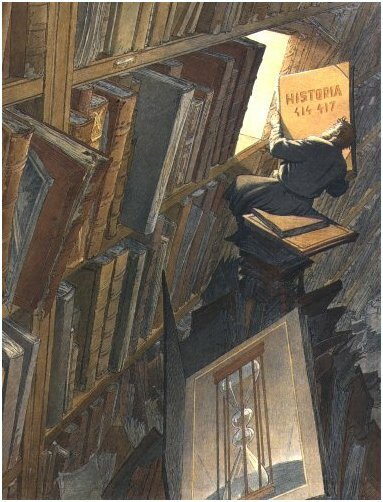 Les Cités obscures (The Obscure Cities) is a series of graphic novels by the Belgian comics artist François Schuiten and his friend, writer Benoît Peeters, set on a counter-earth located opposite to the Earth on the other side of the Sun. In this fictional world, humans live in independent city-states, each of which has developed a distinct civilization, each characterized by a distinctive architectural style. Schuiten’s graphic representations and architectural styles are heavily influenced by Belgian Art Nouveau architect Victor Horta, who worked in Brussels at the turn of the 20th century. In French, the word obscure can mean ‘mysterious’ or ‘hidden’, rather than as in English ‘little known’ or ‘odd’. An important motif is the process of what Schuiten called Bruxellisation, the destruction of his historic Brussels in favor of anonymous, low-quality modernist office and business buildings. Around 1980, Schuiten began drafting a parallel world of vintage architectural grandeur reflecting his 1950s childhood memories of Brussels. Approaching his friend Peeters, who had become a comic writer, about this imaginary world, Peeters infused his own philosophical ideas into plot lines he developed for the project. The first novel in the series, Murailles de Samaris (Walls of Samaris) was serialised in French in 1983 in the Franco-Belgian comics magazine À Suivre published by Casterman. Casterman was also the publisher of The Adventures of Tintin series of comic books by the Belgian cartoonist, Hergé. After Murailles de Samaris, eleven other novels followed, as well as collaborations with other authors on a number of works set in similar settings. Only six of the novels have so far been published in English, Murailles de Samaris being published in 1987 as The Great Walls of Samaris, Stories of the Fantastic. Schuiten’s work can be considered a mix of the scientific fantasies of Jules Verne, the strange worlds of René Magritte, the graphical worlds of M C Escher and Gustave Doré, as well as architectural visions of Horta and Étienne-Louis Boullée. The library in the Office of Obscure Passages. The office records all the passages and crossing points between Earth and the Obscure Cities, and the reports of those who have made the journey. In the 1990s, Schuiten and Peeters convinced the municipality of Schaerbeek, Schuiten’s childhood district, to acquire one of the last remaining buildings in Brussels built by Horta in 1893 for engineer Eugène Autrique and his family, Maison Autrique. The house was fully renovated and is open to the public (photo). 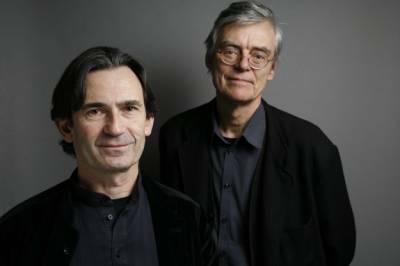 In 1999 Schuiten and Peeters opened a permanent pseudo-documentary exhibition inside, about the Obscure Cities, 19th century Art Nouveau Brussels, and its continuing Bruxellisation destruction during the 20th century. The official website of The Obscure Cities, in French, is Urbicande. 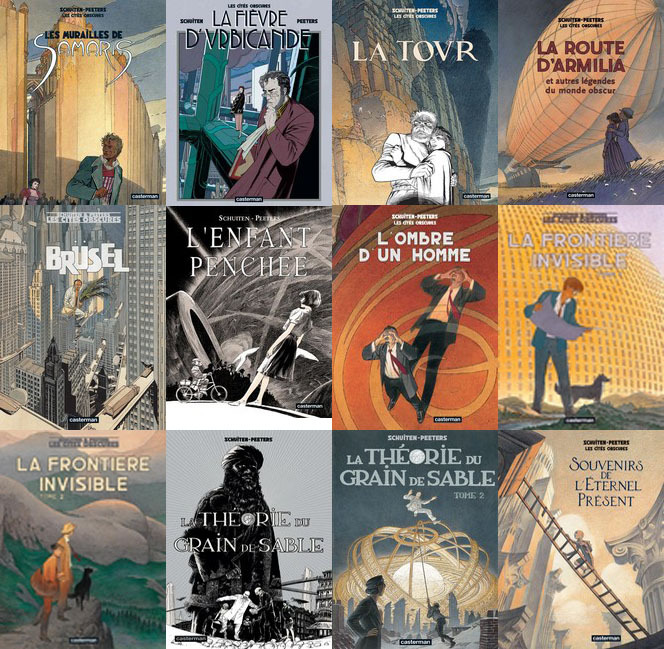 The archive for the works of Schuiten and Peeters is the Wiki-style enyclopedia site, in English, Altaplana. On the website Office of the Obscure Passages (now on the Altaplana site), Schuiten and Peeters present alleged reports, often illustrated with photos and drawings, from people who have crossed over from Earth by accident to the counter-earth of The Obscure Cities via portes (gates) called Obscure Passages. The gates are mostly to be found in buildings and constructions similar or identical to each other on both planets.